Am I alone in having to keep an ‘ideas’ note book by the bed to deal with sleeplessness? I’ve an overactive brain and the notebook is my solution! One such ‘idea‘ that ran through my mind the other night, was a ‘starter’ strategy for improving whole school teaching and learning that I would deploy if given the chance. Obviously not the whole deal, but that starting point or key structure which I’d build around. Cue the bedside light coming on and the notebook and pen out! And; here’s the more detailed digital version. – What do you think my readers? Please share your thoughts and suggested additions to the strategy in the comments sections I’d appreciate perspectives from teachers and leaders alike! This all looks amazing! 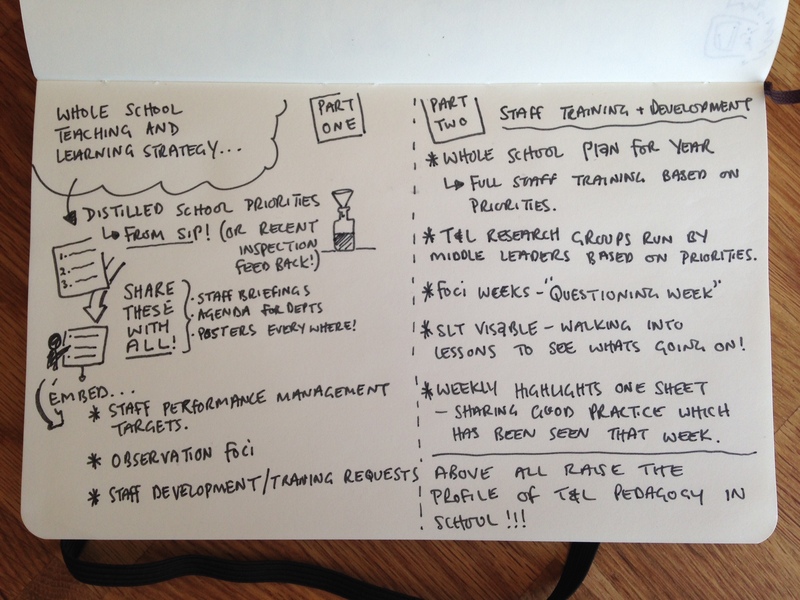 No wonder you can’t sleep – your ‘Leonardo-type’ brain is clearly never switched of… The idea is brilliant: why shouldn’t T&L pedagogy have a high profile? Surely that’s our business in the first place? Thanks for illuminating and inspiring! The plan is missing some fundamental and important tools..peer observation peer planning and peer coaching.